NAS cloud backup is the term that means the technique of saving a copy of your network-attached storage (or some of its crucial content) by doing some NAS backup over Internet. Handy Backup allows you making backup NAS to cloud, automating every step. If you want to backup your NAS online, the first thing you must take into considerations is a backup size, as NAS units are often have much more storage capability than typical cloud accounts. Handy Backup allows you selecting between many clouds to backup your NAS, choosing the most capable vault! Backup NAS to cloud is not a fast activity, and it loads the network heavily. 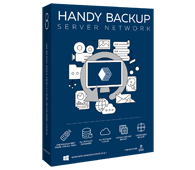 To minimize both size of backups and network usage, Handy Backup contains some technical solutions including incremental and differential backup, as well as compressing your NAS offsite backup data to shrink a traffic! In cloud backup NAS data are prone to accidental or unscrupulous access. To secure these data, Handy Backup allows encrypting the information with a built-in feature. If not to do such a thing, Handy Backup stores all data of online backup for NAS in their native formats, making simple an access to these data! As the NAS backup solution, Handy Backup contains several plug-ins, including all the most popular cloud services. These plug-in often use particular cloud API functions, requiring no third-party software or bridge websites to work properly. 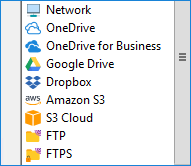 NAS backup to OneDrive is a standard online backup choice for many Windows users. For NAS backup OneDrive provides speed, comfort and a relevant level of security, linking your NAS data with your personal Microsoft account. NAS backup to Google Drive opens a couple of advantages over a user, including sharing, modifying, granular restore (especially in junction with using the native data format) and quickly replicating NAS data. 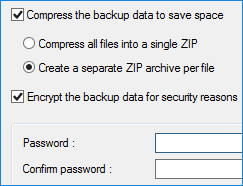 Again, when you store your NAS backup to Dropbox, you will get a quick access and a fast replication of any data you back up. In both cases, the NAS cloud backup can overflow the synchronized folder on your PC! NAS backup to Amazon S3 is an option for advanced and business-level users. Although costly, Amazon S3 provides the best quality and security of data keeping, making it a recommended solution for big amounts of different data. Besides the described collection of biggest and most popular commercial clouds in the world, Handy Backup supports some other cloud services including Yandex.Disk, Box, 4shared and Xref for AutoCAD. It also contains a connection plug-in to its own dedicated backup cloud called HBDrive. Another great option is turning your NAS unit into a private cloud, i.e. a cloud that you own. 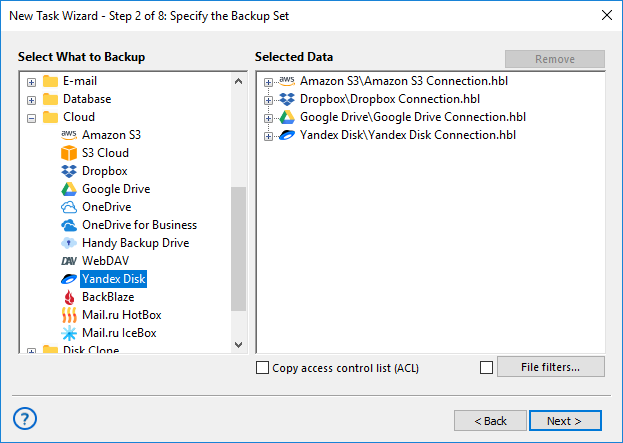 Handy Backup has the universal option to access any of these private clouds, making a WebDAV connection between a cloud and other components of the backup solution. The complete solution for online backup, the Handy Backup Server Network Edition can backup NAS to cloud storages, as a part of its unified network backup strategy, saving any data type existed as copies. Try free for 30 days! Operating tasks along with other programs started before/after the NAS cloud backup. As described above, Handy Backup provides a plenty of choices to make NAS cloud backup. 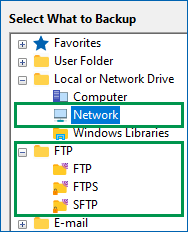 You can use “Network”, “FTP”, “SFTP” or “FTPS” plug-ins, as well as the “WebDAV” plug-in, to access your NAS configured as a particular storage type, as well as any cloud plug-ins as the destination. Backup NAS to cloud services with Handy Backup, to get a fully automated NAS backup solution. To experience its might, download a full version of Handy Backup for a 30-days free trial just now!